Your cultural itinerary includes sights like Perlan and Reykjavik Open Air Museum. Your inner history buff will appreciate Grotta Lighthouse and Einar Jonsson Museum (Listasafn Einars Jonssonar). You'll find plenty of places to visit near Reykjavik: Viking World (in Keflavik), The Settlement Center (in Borgarnes) and Reykjadalur Hot Springs (in Hveragerdi). There's much more to do: witness a stunning natural landmark at Gunnuhver Hot Springs, head off the coast to Videy Island, contemplate the long history of Hofdi House, and make a trip to The Statue of Leif Eiriksson. To see maps, more things to do, where to stay, and other tourist information, use the Reykjavik vacation maker . Great Falls, USA to Reykjavik is an approximately 19-hour flight. You'll lose 7 hours traveling from Great Falls to Reykjavik due to the time zone difference. When traveling from Great Falls in May, plan for little chillier days in Reykjavik, with highs around 49°F, while nights are about the same with lows around 38°F. Finish up your sightseeing early on the 19th (Sat) so you can travel to Reykjahlid. Visiting Krafla Lava Fields and Mt. Namafjall (Namaskard) will get you outdoors. Discover out-of-the-way places like Hverarond and Hverfjall. To see other places to visit, where to stay, maps, and other tourist information, use the Reykjahlid itinerary planner . Traveling by combination of flight and bus from Reykjavik to Reykjahlid takes 4 hours. Alternatively, you can do a combination of flight and bus; or drive. 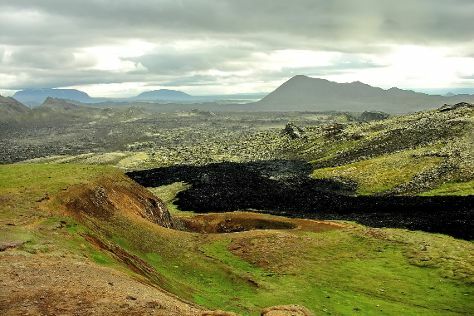 In May, daytime highs in Reykjahlid are 49°F, while nighttime lows are 37°F. Wrap up your sightseeing on the 22nd (Tue) early enough to drive to Akureyri. Start off your visit on the 22nd (Tue): surround yourself with nature on a nature and wildlife tour and then get up close to creatures of the deep with a dolphin and whale watching tour. Get ready for a full day of sightseeing on the next day: examine the collection at The Industry Museum, pause for some serene contemplation at Akureyrarkirkja, take in the architecture and atmosphere at Catholic Church (Katholska Kirkjan), then admire the natural beauty at Arctic Botanical Gardens (Lystigardurinn), and finally take an in-depth tour of The Old Farmhouse Laufas. To see more things to do, other places to visit, and tourist information, use the Akureyri trip planner . Traveling by car from Reykjahlid to Akureyri takes 1.5 hours. Alternatively, you can take a bus. May in Akureyri sees daily highs of 49°F and lows of 37°F at night. Finish up your sightseeing early on the 24th (Thu) so you can travel to Vik. Start off your visit on the 24th (Thu): admire the sheer force of Gljufrafoss and then see the interesting displays at Skogasafn. Here are some ideas for day two: contemplate the geological forces at Skaftarstofa, take in breathtaking views at Fjadrargljufur Canyon, then take in the spiritual surroundings of Vik Church, and finally don't miss a visit to Crashed DC 3 Plane. To find ratings, more things to do, other places to visit, and tourist information, go to the Vik trip builder app . Traveling by combination of flight and bus from Akureyri to Vik takes 6 hours. Alternatively, you can drive; or do a combination of bus and flight. May in Vik sees daily highs of 46°F and lows of 41°F at night. Wrap up your sightseeing on the 26th (Sat) early enough to drive to Hella. Hella is a small town in southern Iceland on the shores of the river Ytri-Rangá and has, as of 2011, 781 inhabitants.Hella is situated to the east of Reykjavík on the Hringvegur (Route 1) between Selfoss and Hvolsvöllur.OverviewThe name of the town comes from caves near the river. 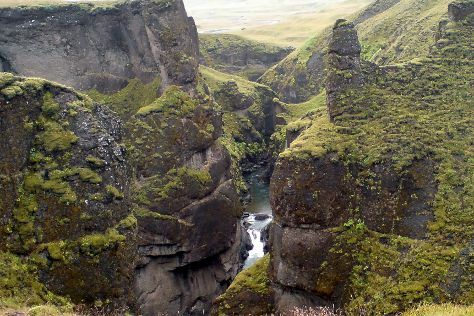 On the 27th (Sun), admire the sheer force of Gluggafoss/Merkjarfoss, surround yourself with nature on a nature and wildlife tour, and then take a pleasant ride with a tour on horseback. Get ready for a full day of sightseeing on the next day: get outside with Hekluhestar and then do sightseeing your way with Southcoast Adventure. To see reviews, other places to visit, photos, and tourist information, refer to the Hella trip planner. Traveling by car from Vik to Hella takes 1.5 hours. Alternatively, you can take a bus. May in Hella sees daily highs of 46°F and lows of 41°F at night. Finish up your sightseeing early on the 28th (Mon) so you can travel back home.